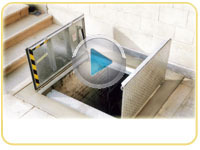 Here at Cellar Access we have been committed totally to design, manufacture and installation of basement and cellar trap doors for over 30 years. We are not middle men and do not source our products from subcontractors. We pride ourselves on building the highest quality product(s) from start to finish. With our attitude and working practise to providing "Outstanding" products for our customers we have been involved with some of the largest companies and establishments around. Such concerns include multi national high street chains, financial institutes, top Universities and aristocracy to name a few. We have grown to become the industry leaders through out the U.K and Europe in our field. Based in the midlands allows us best access equally to all parts of England, Scotland and Wales along with frequent business with Europe. Being market leaders in external and internal cellar trap door(s) we can provide lasting, secure and aesthetically pleasing products in short turn around times. Our standardised External Cellar Door(s) are powered with a gas strut opening system, weather resistant seals and Stainless Steel furniture. The choice of our internal cellar or basement doors range from the health & Safety Grille door, the tested an certified 60 minute fire door, the Clear View Door, our matching floor finish door known as the Tray Type, the Beer drop door(s) and our Staircase door(s). Over the last few years there has been an ever increasing popularity towards domestic wine cellars. We have been pleased to supply customers who have had an existing cellar or basement with practical and feature door sets to suit a variety of situations and dimensions. Whether the wine cellar has a spiral staircase, steps or a set of ladders to enter we can built to suit. Responding to demand, we now offer electrical operation door(s) that can be operated via a hands free remote control handset or by a hard wired switch. This option can be fitted to a range of doors to lift and lower them. We are a family business and deal with your particular requirements without agents, reps or sub contactors. Along with this we manufacture all items in our own purpose built workshops and fit most items personally. All our advice is free and is born from a massive experience in this specific particular field. We do not want to make anything for customers, which they will be anything less than delighted with. Customer's complete satisfaction is paramount.